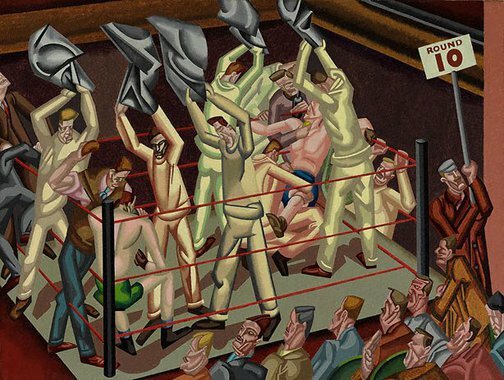 According to the conventional lineage of modernist art history, vorticism was the English progeny of cubism and futurism. Among its youngest adherents was the author of this robotic report of a boxing match. By the time he painted it, however, William Roberts had already passed through and abandoned the extremes of vorticist practice in favour of a less radical academic cubism. Even so, 'The interval before Round Ten' is a painting imbued with the edgy virility so loved by the vorticists, as indeed by futurists such as Marinetti. Aggression in human behaviour is given visual form in the agitated activity and angular arrangements of Roberts design. And design is the right word for this deliberately anti-naturalist composition. The ferocity Roberts brought to bear on his subjects is akin to caricature. Little fellow-feeling softens his vision of the all-male madness of pugilism, though the painter delighted in it all the same. 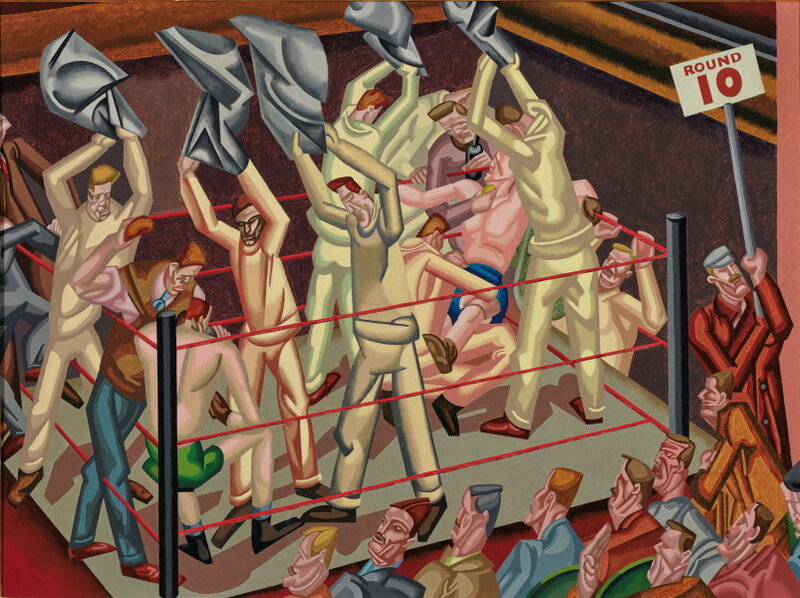 Fernand Leger's interests in proletarian themes, and something of his tubular style, infiltrate Roberts's work. Contemporary Art Society, London, 1963-Jul 1965, London/England, Gift of the Contemporary Art Society, London 1965. Received 1967. Art Gallery of New South Wales picturebook , Sydney, 1972, 43 (colour illus.). René Free, Art Gallery of New South Wales handbook , 'European', pg. 36-56, Sydney, 1988, 55. Renée Free, AGNSW Collections , 'The Western Heritage, Renaissance to Twentieth Century', pg. 108-172, Sydney, 1994, 160 (colour illus.). Art Gallery of New South Wales catalogue of British paintings , Sydney, 1987, 169 (illus.). Renee Free, Art and Australia , 'European Collection', p.63-75, Sydney, Jul 1972, 75 (illus.). Modern Britain 1900-1960 , Melbourne, 2007, 69 (colour illus.). Bruce James, Art Gallery of New South Wales handbook , 'Western Collection: Paintings and Sculpture', pg. 17-77, Sydney, 1999, 56 (colour illus. ).